Ballymena United striker, Cathair Friel scored the decisive goal as the Braidmen saw off Ballinamallard. 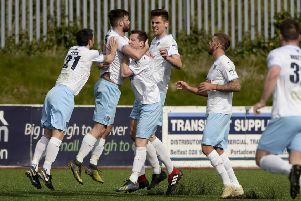 BALLYMENA United got their league campaign back on track with a narrow victory over basement side, Ballinamallard United at the Showgrounds. It was just the one goal which separated the teams at the full-time whistle but the home side should really have been out of sight at half-time such was their dominance. Tony Kane put the Sky Blues ahead four minutes before the break with his third penalty of the season and second against the Mallards!. Cathair Friel then netted his eighth league strike of the campaign when he bundled Johnny McMurray's cross over the line at the back post on 57 minutes. Substitute, Gary Armstrong pulled one back with six minutes left on the clock but Ballymena did enough to clinch victory which moved them to within one point of sixth placed Glentoran. The Sky Blues pressed high in the opening stages and really should've got off the mark as early as the third minute. Francis McCaffrey did well to send Steven McCullough into space on the left flank and his superb inswinging cross found the head of Conor McCloskey who somehow sent his six yard effort wide of the target. Johnny McMurray then charged down Ryan McConnell in a dangerous area inside the Mallards' half, won possession and raced towards the near post, however, the striker poked his shot into the side netting. Kyle Owens then miscued his strike at the back post following a corner kick on 14 minutes as the pressure continued to mount for the visitors. For all of the home side's dominance they could so easily have found themselves a goal behind after a mistake from goalkeeper Ross Glendinning on 21 minutes. Jonathan Leddy's free-kick from 20 yards was spilled by the Ballymena stopper but when the rebound fell to Shane McGinty, Glendinning recovered well to save at his feet. Conor McCloskey tried a speculative half volley from 30 yards which was gathered comfortably by Richard Brush before McMurray's close range header was again stopped by the Mallards keeper. McMurray found himself clean through on goal on 38 minutes following a clever ball over the top but his attempted lob of the advancing keeper went wide of the far post. With half-time fast approaching Ballymena defender Owens had a header cleared off the line before Kofi Balmer struck the underside of the crossbar from the rebound. The Mallards were unable to clear the danger and when Joseph McKinney went to ground under the challenge from McConnell, referee, Raymond Crangle pointed to the spot. Up stepped Tony Kane who made no mistake when tucking the ball into the corner as the Sky Blues took a slender but deserved lead into the interval. And Ballymena came so close to doubling their advantage 60 seconds after the restart when McMurray got in behind the Mallards defence and sent a pinpoint cross towards his strike partner, Cathair Friel who headed narrowly over the bar. The Sky Blues netted their second of the afternoon on 57 minutes when McMurray screwed his cross towards the back post where Friel was on hand to bundle the ball into the net. Friel was gifted a glorious chance to add his second four minutes later when again McMurray picked up a loose Brush clearance and unselfishly played him through, but the striker blasted wide. Ballinamallard cut the deficit in half with six minutes to go as Gary Armstrong found the back of the net but it was too little too late as Ballymena secured a deserved victory. Ballymena United - R. Glendinning: J. Ervin, K. Owens, K. Balmer, S. McCullough (M. Shevlin 86); C. McCloskey, J. McKinney, T. Kane, F. McCaffrey; J. McMurray, C. Friel; Subs Not Used - S. McAlorum, E. Kane, C. Brennan, J. McNeill. Ballinamallard - R. Brush: R. McConnell, M. Smyth, B. McCann, R. Taheny; S. Hutchinson, B. Burns, J. Leddy (R. Curran 69), J. McCartney (G. Armstrong 77); S. McGinty; C. Martyn (N. Owens 77); Subs Not Used - C. McLoughlin, J. McKenna.